Why do I give? As immigrants to this great nation, my husband Ming and I worked hard and achieved the American dream. After he graduated from William & Mary, Ming built a successful naval career and became the first naturalized Asian-American to be selected as an admiral in the U.S. Navy. Now it is our turn to help others achieve success, just as so many had helped us. Why do I give? Everyone has their own story for why they give. Mine starts with my courageous wife whom I lost to cancer eight years ago. She was my best friend and my hero and I wanted to mark her presence in a positive way. For me, giving to William & Mary seemed like the most obvious thing to do. By supporting VIMS through her estate plan, Debbie is doing her part to assure that this critical work will continue to move forward. “I’m happy knowing I will be helping the next generation of students build a life in science and make the world a better place to live.” And as far as Debbie is concerned, there is no better gift than that. As the first female division controller at Hewlett Packard, Glenne Harding ’65 spent her career breaking down the glass ceiling. 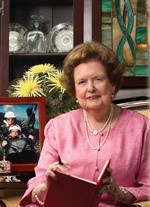 When she retired, she turned her focus and her energy on giving back to William & Mary. Glenne cares deeply about her alma mater — that's why she named the university as a beneficiary of her Individual Retirement Accounts. The IRAs provide a source of income, and someday, the proceeds will benefit the Glenmore H. Harding Endowed Scholarship to support out-of- state students with financial need. “I remember cleaning test tubes for my biology professor who was conducting research over on the Gloucester campus,” says Win Whitehurst of her earliest memory of the Virginia Institute of Marine Science. “It was only later in life that I came to understand the importance of their work to the health and conservation of our rivers and the Chesapeake Bay.” Win’s husband, Milton Cloud, shares her appreciation of VIMS and its valuable mission. When the couple began to consider their estate plans, they decided to establish a permanent endowment to support VIMS and the School of Marine Science. They also made a provision for Milton’s alma mater, Westminster Choir College. With their estate plans in good order, Win and Milton hope to have more opportunities to visit the VIMS campus including, of course, some time aboard the Bay Eagle. 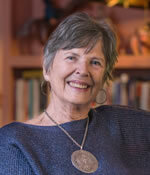 Judy Ewell has traveled the world but as professor emerita of Latin American history, William & Mary has always felt like home. In her 32 years at the College, Judy mentored countless students, received outstanding faculty awards, and led the way to recruit more women faculty. Judy knew her personal legacy would be for the College. With assistance from the Gift Planning Office, she established a charitable gift annuity to provide her with income for life and named William & Mary as a beneficiary of her retirement plans. 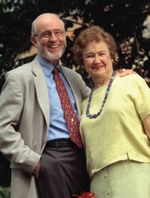 When Kermit Buntrock began to consider his charitable plans, he was interested in a vehicle that would provide income to his sister, Ann, and a future gift to William & Mary. Working with the Gift Planning Office, he established a charitable remainder trust that provides income to Ann for her life. Kermit received a current income tax deduction and also saved capital gains tax. When John and Virginia Bennett began to consider their charitable plans, they were interested in a vehicle that would support their busy retirement while providing a future gift to William & Mary. Working with the Gift Planning Office, the couple established two charitable trusts. One trust provides a fixed income while the other trust provides a variable income that may grow over time. The Bennetts are using a portion of their income payments from the trusts to help their grandchildren. “This was one of the best decisions we ever made,” says “Wicky” as she is known to her classmates. John agrees. With their charitable plans in good order, John and Virginia have more time to enjoy their retirement years, including frequent visits with their family. The future proceeds from their trusts will be used to establish permanent endowments, bene ting students and faculty in perpetuity. As longtime members of the Honorable Robert Boyle Legacy Society, Jim and Bunny Neff know the importance of good planning. When Bunny’s 50th Reunion came along, the couple wanted to support her class gift in a way that would bring their charitable and financial plans together. The Neffs were familiar with the charitable gift annuity since they had established one with Dartmouth, Jim’s alma mater. Working with the Gift Planning Office, Jim and Bunny established a gift annuity that provides fixed annual payments for life. These payments will never vary and are backed by the full faith and credit of the College of William & Mary Foundation. They also saved income taxes and capital gains taxes. 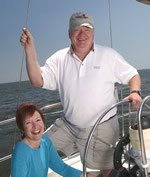 Their gift annuity helped Jim and Bunny achieve their goals. And we’re pleased to report that Bunny’s class did, too. Since that first day they met in freshman math class, Steve and Linda Mitchell have shared many lasting memories of their college years. As time has passed, their appreciation for William & Mary has only deepened. Like many, they were looking for a way to commemorate this special time and place in their lives. With assistance from the Gift Planning Office, the Mitchells made a provision for the College in their wills. Their bequest will establish an unrestricted endowment to meet the most pressing needs of William & Mary in the future. Now that Steve and Linda have completed their estate plans, it looks like it’s smooth sailing. When you think about Mitchell and Lois Byrd, commitment and dedication are words that come to mind. 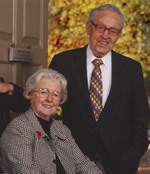 The couple has a combined 83 years of service to William & Mary. Lois started in the office of continuing studies in 1966, then worked in the College's health center until retiring in 1991. 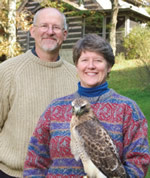 Mitchell, an ornithologist and one of the nation's foremost experts on the peregrine falcon, taught in the biology department for 36 years until his retirement in 1992. He then went on to establish the Center for Conservation Biology with Bryan Watts in 1992. Today, the “Byrd Man” as he is affectionately known, remains involved with the Center's activities, including the annual bald eagle census flights each spring. When the couple began to consider their charitable plans, naturally William & Mary came to mind. With assistance from the Gift Planning Office, Mitchell and Lois established a charitable gift annuity, one of the oldest and most popular vehicles for those seeking a steady, dependable income during retirement. In exchange for their tax-deductible gift, they receive fixed, annual payments for life. These payments will never vary and are backed by the full faith and credit of the College of William & Mary Foundation. A portion of each payment is tax-free. 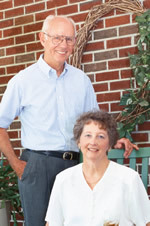 Mitchell and Lois were so pleased with their gift annuity, they established a second one several months later. The future proceeds from their gift annuities will support the Center for Conservation Biology. 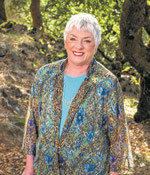 With an active career that she enjoys, Laura Sullivan doesn't have plans to retire any time soon. But like many at this stage in life, Laura was interested in a charitable plan that would save taxes now while she is working, then provide income later when she has retired. And she wanted to combine these benefits with a future gift to William & Mary. Working with the Gift Planning Office, Laura found the perfect charitable plan: a deferred payment gift annuity. In exchange for her gift to William & Mary, Laura received a charitable deduction which saved income taxes. The annuity payments are deferred until she retires and then will continue for her life, backed by the full faith and credit of the College of William & Mary Foundation. The future proceeds from her deferred gift annuity will support Intercollegiate Athletics and the Modern Languages and Literatures Department. Donald Sweig spends a lot of time in some beautiful places. An avid birder and nature photographer for many years, he's had more time to indulge his passions since retiring in 2002. 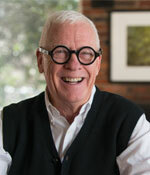 While gazing through the camera lens, Donald started looking back on his life and how William & Mary helped shape it. 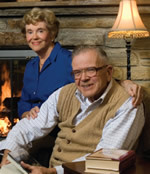 As he began to consider his estate plans, he wanted to help future generations benefit from scholarships just as he did. With assistance from the Gift Planning Office, Donald included a bequest in his will to support graduate students in history. “This was just the right time in our lives. We really feel good about this." Rik and Carrie Hanley seem to make all the right moves. With two careers that allow them the flexibility to live wherever they choose, they chose to make their home in Williamsburg a few years ago. Rik has many good memories from his student days and now he and Carrie are creating new ones as they discover all that the Williamsburg community has to offer. Though the couple moved quickly to engage with William & Mary from the time they first arrived, “it was actually our financial advisor Rick Overy ’88 who first suggested we consider the College in our estate plans”, explains Rik. “He's an alumnus too, so naturally the conversation turned to William & Mary.” With assistance from the Gift Planning Office, the Hanleys made a provision in their living trust that will establish permanent endowments to support scholarships and the Muscarelle Museum. Now that's a good move for Rik, Carrie, and future generations. From the moment Mike Smith first stepped on campus for summer band camp as a high school student, he knew he was destined to make music at William & Mary. Naturally, Mike continued with band throughout college, assisting legendary Band Director Charles Varner with the summer band camps where he earned the nickname “Captain Clarinet.” He's maintained a lifelong connection through the Alumni Band, joining his former bandmates and others to perform at Homecoming halftime shows. When Mike began to consider his estate plans, he wanted to commemorate the wonderful experience he had in the William & Mary Band and to help preserve and strengthen this experience for those who will follow. So Mike contacted the Gift Planning Office for proper language for his IRA beneficiary form. His bequest will establish a permanent endowment to help ensure that for future generations of William & Mary students, alumni, friends, and fans, the band will indeed play on. As a chemist, David Kranbuehl knows the importance of choosing the right formula to achieve the best results. When David's retirement approached, he and Marjolane were interested in a charitable plan that would enhance their income while providing a future gift to William & Mary where David taught in the chemistry department for more than 40 years. Working with the Gift Planning Office, the Kranbuehls established a charitable remainder trust that pays income to them for 10 years, then distributes the remaining assets to William & Mary. In choosing the term of years option for their trust payments, the couple received a larger income tax deduction which saved income taxes. And since they funded the trust with appreciated securities, they also saved capital gains tax. They can also add to their trust at any time to increase the value which in turn will increase the amount of income they receive. When the trust ends, the proceeds will be used to establish permanent endowments in support of the modern languages and chemistry departments. Now that's a good formula for good planning. Throughout her life, Sally Lichtenstein has often consulted her older brother, Pete Siegenthaler ’61 on many important decisions. “One of the earliest examples of Pete’s good advice was to attend William & Mary, which I did, a couple of years behind him”, notes Sally. So when Sally began to consider her charitable plans, naturally she talked them over with Pete. After considering a number of options, “we kept coming back to a William & Mary Gift Annuity,” she says. In exchange for her gift, Sally receives fixed annual payments for life which will never vary and are backed by the full faith and credit of the College of William & Mary Foundation. Sally also saved income taxes and capital gains taxes. Best of all, the future proceeds from Sally’s gift annuity will be used to establish a permanent scholarship endowment. We couldn’t pull Pete in the picture but he’s smiling just off camera. And waiting to go out and celebrate Sally’s good charitable planning. 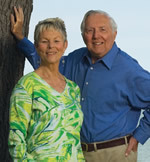 Ken and Judi Lownes have always shared a passion for helping to beautify the world around them. When Ken sold his landscaping business, the couple moved to Williamsburg and both soon became involved with the School of Education. This led to Ken's generous offer to help beautify the School's new facility with a variety of attractive indoor plants which he faithfully maintains on a weekly schedule (yes, those are a few of his selections in the photo awaiting their new home any day now). When Ken and Judi began to consider their estate plans, they wanted to help the School of Education continue to grow in the future. With assistance from the Gift Planning Office, they made a provision to establish a permanent endowment for the perpetual support of the School of Education. With their estate plans in good order, it looks like things are "growing well" for Ken, Judi, and William & Mary's School of Education. Bruce Holbrook has never been shy about encouraging his William & Mary clients to consider the College in their charitable planning. And like every good accountant, he will undoubtedly point out the tax benefits. But give him a minute more and he'll tell you how much he and Suzie have enjoyed seeing students benefit from the Holbrook Family Endowment they established several years ago in the Mason School of Business. So naturally when the couple began to consider their estate plans, they wanted to help their endowment grow even more in the future. They contacted the Gift Planning Office for proper bequest language, then put their plans in place. Now Bruce says he has something else to talk with his clients about. When Jim and Babs Korman decided to contribute one of their rental properties to William & Mary, they were pleased with how well everything came together. The Gift Planning Office helped guide them through the process every step of the way. The College's Real Estate Foundation handled all the details of listing and selling the property. This left Jim and Babs with more time to focus on the most important detail of all: benefiting William & Mary. After considering a number of options, the couple decided to designate the sale proceeds for need-based scholarships. “We can't imagine a better use for our condo than helping students attend William & Mary,” the Kormans agree. Jim says giving their condo was as much fun as he and Babs had in college. Well, almost. As Jackie's 50th Class Reunion approached, she began to think about her estate plans. She wanted to commemorate her special ties to William & Mary in a way that would support future generations. Working with the Gift Planning Office, Jackie made a bequest in her will to establish a permanent endowment. The annual income from her endowment will support student and faculty research in perpetuity, which, Jackie agrees, is a very long time. As a retired teacher and elementary school principal, Mary Murphy knows the importance of preparing future generations of educational leaders. For several years now, her annual gifts have helped support graduate students in the School of Education's Policy, Planning and Leadership program. When Mary began to consider other ways to support William & Mary, she was interested in a charitable plan that would provide current income and a future gift to help endow her annual scholarship. Mary was familiar with the charitable gift annuity since a friend had established one with her alma mater several years ago. Working with the Gift Planning Office, Mary established a charitable gift annuity that will provide fixed annual payments for life. These payments will never vary and are backed by the full faith and credit of the College of William & Mary Foundation. Mary also saved income taxes and capital gains taxes. With her charitable plans in good order, Mary has more time to indulge her passion for reading via the latest technology or the good old fashioned way. On the tennis court, Millie West is known for her competitive spirit and a formidable serve. Off the court, Millie has served William & Mary for more than 50 years as a dedicated coach, administrator, and fundraiser. Today, she can often be found at the ITA Women's Hall of Fame in the McCormack-Nagelsen Tennis Center where she serves as curator. When Millie began to consider her charitable plans, she was interested in a vehicle that would provide income now and a future gift to William & Mary. With assistance from the Gift Planning Office, Millie established a charitable remainder trust. In addition to the steady income she receives from the trust, Millie saved income taxes and avoided capital gains tax. The future proceeds from her trust will provide support for the Women's Tennis Program and Olympic Sports Coaches. With her charitable plans in good order, Millie says she has more time to work on her tennis serve while continuing to serve the College she loves. As everyone who knows Sunny Williams will tell you, William & Mary is always on her mind. So when Sunny began to consider her charitable plans, naturally she turned to William & Mary. With assistance from the Gift Planning Office, she established a charitable gift annuity, one of the oldest and most popular vehicles for those seeking a steady and dependable income during retirement. In exchange for her tax-deductible gift, Sunny receives fixed annual payments for life. These payments will never vary and are backed by the full faith and credit of The College of William & Mary Foundation. A portion of each payment is tax-free. Sunny has been so pleased with her gift annuity, she plans to establish another one each year. The future proceeds from her gift annuities will be added to The Rolf and Sunny Williams Family Professorship For The Arts. When Randy and Shelby Hawthorne purchased their first rental property several years ago, they never imagined where it might lead. Though both have maintained busy careers, they have steadily acquired other properties, enjoying the many benefits of investing in real estate along the way. When the couple began to consider their charitable plans, they decided to contribute one of their properties to a trust that will provide income for their lives and a future gift to the Mason School of Business. They received an income tax deduction based on the appraised value of the property and avoided capital gain taxes. Once the property was deeded to the trust, the College's trustee handled all of the details of managing and selling the property. This has been such a positive experience, Randy and Shelby have decided to fund similar trusts with their other properties as part of their future income, tax and charitable planning. This plan, they agree, will also help simplify their lives when they retire in a few years. Pete and Judy Nance know the benefits of good planning. When the couple began to consider their goals, they were interested in a charitable plan that would provide a steady income during the initial years of their retirement, followed by a gift to William & Mary. Working with the Gift Planning Office and their financial advisor, they established a charitable remainder trust that pays income until Pete begins taking withdrawals from his retirement accounts several years from now. At that time, the remaining assets in the trust will be used to establish a professorship in their daughter, Sara's, memory. While the income and capital gain tax savings were welcome news to their accountant, Pete and Judy say the greatest joy is seeing their gift benefit students and faculty during their lifetime — just the way they planned it. Glenn Crafford knows a good investment when he sees one. On one of his many visits to Williamsburg, he purchased a nearby town home. While Glenn enjoyed a steady rental income and other benefits of owning investment property, the town home continued to appreciate over the years. When Glenn began to consider his charitable plans, he decided to contribute the property to William & Mary. He received a charitable deduction for the appraised value and also saved capital gain taxes. The College's Real Estate Foundation handled the details of the property sale from start to finish. 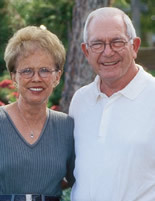 When Sid and Carole Barrett started thinking about their charitable and estate plans, they had several goals in mind. They were looking for a way to supplement their retirement income and make a future gift to William & Mary, while still preserving their estate for their children. Working with the William & Mary Gift Planning Office and their professional advisors, they found the solution: a charitable remainder trust to provide current income and a life insurance trust to replace the contributed assets in their estate for their children. When you meet a Schaubach scholar-athlete or visit the Alumni Center, you might be surprised to learn that both are being supported today by the proceeds from a trust Elliott and Carolyn Schaubach established several years ago. The type of charitable trust they chose is called a term of years or term trust. It has been more than 10 years since Jay and Marguerite Huff Brown ’54 established their charitable trust with William & Mary. When Marguerite's 50th Reunion came along, the Browns wanted to support her class gift in a way that would meet their other financial and estate planning needs. Working with William & Mary's Gift Planning Office, the Browns decided to make a series of annual additions to their trust. These additions will increase the value of their trust, which in turn increases the income payments they receive from the trust. The Browns also receive a charitable income tax deduction when adding to their trust. And since they have chosen to make these additions with appreciated securities, they also save capital gains tax. Inspired by the memory of their nephew, Patrick Brown, the couple decided to designate the future proceeds from their trust for a scholarship to support students working their way through college. As an active retiree, Ruth Tillar enjoys traveling to far off places with alumni and friends where she indulges her passion for adventure (yes, that's Ruth in the framed photo paragliding 4,000 feet over the Swiss Alps!). When she's not touring with the Alumni Journeys travel program, she's likely to be journeying to Williamsburg for some special event on campus. Like many retirees, Ruth was interested in a charitable plan that would support her busy lifestyle while providing a future gift to William & Mary. Working with the Gift Planning Office, Ruth chose one of the most versatile vehicles to accomplish her objectives: a charitable remainder trust. In addition to the steady income she receives, Ruth saved income taxes and avoided capital gain taxes. The future proceeds from her trust will be used to support the Alumni Association. Now wherever her journeys take her, Ruth knows her William & Mary trust will be there to support her. 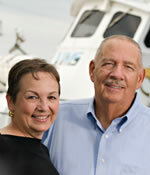 Jack Russell and Lee Chichester have always enjoyed sharing their home with friends and family. So when the couple began thinking about their charitable plans, they decided to share it with William & Mary, too. With assistance from the Gift Planning Office, Jack and Lee contributed a remainder interest in their home while retaining the right to live there during their lifetimes. Should they ever decide to move, the property would then be sold. Jack and Lee would receive their proportionate share of the sale proceeds along with William & Mary. By contributing their home in this way, the couple received a substantial charitable deduction which saves current income taxes. The future proceeds from their gift will be used to establish a professorship in their names. With their charitable plans in good order, Jack and Lee feel right at home with their decision. Like many alumni and friends, Bill and Nancy Young reached a point where looking back on their lives led them to look forward to their future legacy. The rest was easy. "All we had to do was contact the Gift Planning Office. They walked us through everything." Since retiring to Williamsburg nearly 20 years ago, Andrew and Dorothy Haramis have been active volunteers in many community organizations. One of the greatest benefits, they agree, has been the opportunity to meet many William & Mary students who are also involved in community service. “You should see these students in action — they're outstanding,” says Dorothy. The Haramises have been so impressed with the students they have met, they decided to establish a scholarship through their estate plans. The William & Mary Gift Planning Office provided the language for their attorney to add a codicil to their will. Maggie Glauber has that certain peace of mind that comes from knowing that she has planned well for the future. Like many, her estate plans include a revocable trust, durable power of attorney, and a living will. And of course, a thoughtful bequest for William & Mary. With language provided by the William & Mary Gift Planning Office, Maggie had her attorney include a charitable provision in her trust. 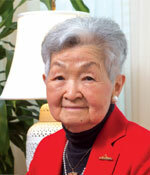 Her bequest will support unrestricted endowment and establish a scholarship in her name. 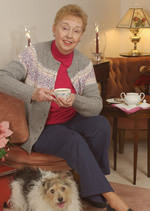 With her estate plans in good order, Maggie says she has more time to spoil Sam, her 12 year old Jack Russell terrier. "Like William & Mary, Sam gets a lot of my attention." When John and Julie Dayton began to consider their charitable plans, they were interested in a vehicle that would provide income now and a future gift to William & Mary. The couple owned some undeveloped property that John had purchased years earlier. Though the property had increased in value, it was not producing any income. Working with the Gift Planning Office, the Daytons contributed the property to a charitable remainder trust that provides income for their lives. They received a current income tax deduction and avoided capital gains tax. The future proceeds from their trust will support students participating in the Reves Center Foreign Service Internship Program. Whether it's retirement planning, estate planning, or charitable planning, Barbara Maguschak takes the same thoughtful approach. “I'm accustomed to seeking out information and advice, then making my own decisions,” she says. 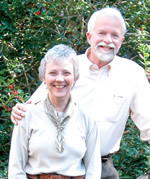 When Barbara began to consider her charitable plans, William & Mary naturally came to mind. She contacted the Gift Planning Office for assistance in naming William & Mary beneficiary of her 401(k) and other retirement plans. Her bequest will create a permanent endowment for Swem Library, where she enjoyed working as a student. Education has always been important to Richard Copeland, a retired educator himself. When he began to reflect on his life, he wanted to honor his parents and William & Mary in a meaningful and lasting way. With assistance from the Gift Planning Office, Richard made a provision in his estate plans that will create two permanent funds: a scholarship in his parents' names and another in his name for students in the School of Education. “My parents and William & Mary helped shape and enrich my life in so many ways. I hope my scholarships will do the same for future generations,” he says. Now that his estate plans are in good order, Richard says the fish are biting better than ever.